Stretch fabrics for dressmaking are great for figure-hugging designs, and are mostly either man-made or silk mixed with a small amount of elastic yarn. Most are also highly drapey - one notable exception being stretch duchess satin. 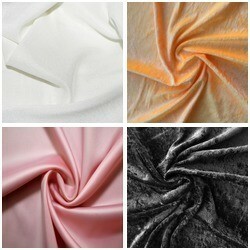 The most popular stretch silk mix is jersey - a knitted dress fabric with extra 'give'. There are stretch fabrics for all occasions and types of garments from wedding dresses to breathable, comfortable casual wear, from georgette to satins and velour.